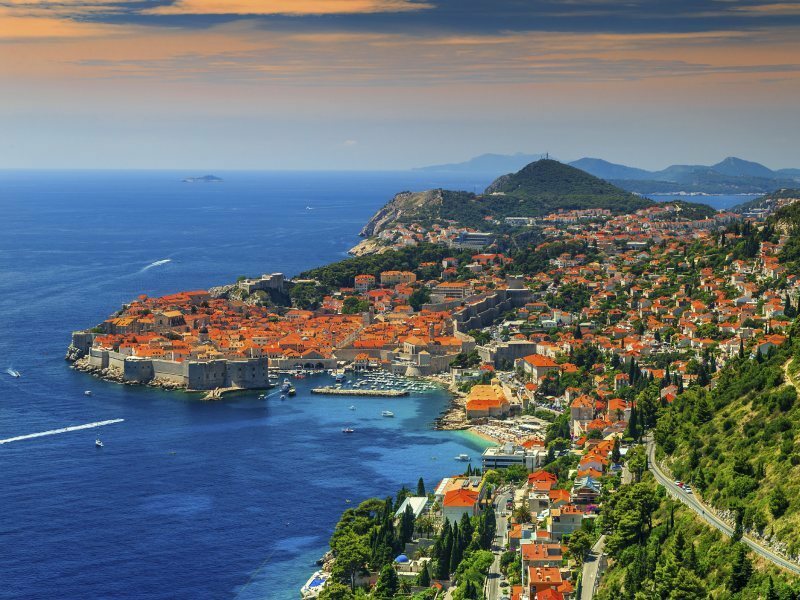 Join us in one of Europe’s most popular holiday destinations – Croatia, Bosnia-Herzegovina, and Montenegro. Spend three nights on the Markarska Riviera, where you’ll discover the exquisite cities of Split and Trogir, then head south to spend four nights close to the walled city of Dubrovnik. Explore Southern Croatia’s coastline, see historic Mostar in Bosnia and Herzegovina, and visit one of Europe’s most unspoiled countries: beautiful Montenegro. Fly from the UK to Dubrovnik, meet your Tour Manager, then transfer to your hotel in Drvenik, a coastal town on the shores of the Adriatic. Visit Croatia’s second-largest city, Split, on today’s included tour. Wander the Old Town, visit the palace of Roman Emperor Diocletian, and browse the busy marketplace. From here, we’ll continue to the fascinating island-town of Trogir, entering from the mainland through a baroque Land Gate to discover a time-warped jumble of palaces, ancient churches and hidden courtyards. After exploring, you’ll return to the hotel for dinner. Today’s included excursion takes in the tumbling waterfalls, deep gorges and clear lakes of beautiful Krka National Park, which stretches some 12 miles up a lavendar-clad valley from the harbour-town of Skradin. Stroll along wooden walkways though the forest at your own pace, and discover a park that previous customers have called “indescribably beautiful”. This morning, you’ll head past the River Neretva delta on the way to Bosnia-Herzegovina, and Mostar, famous for the lovingly restored medieval bridge that spans the river. After exploring this distinctive, UNESCO-listed town, boasting one of Europe’s oldest continuously running markets, you’ll travel to your second hotel base, close to Dubrovnik. Join our guided tour of Dubrovnik, today, and you’ll see the Renaissance Sponza Palace, baroque St Blaise’s Church, and the Franciscan Monastery (home to Europe’s oldest pharmacy). Take in the views across Dubrovnik and the blue Adriatic from the city walls, and spend a free afternoon sightseeing or shopping, before returning to the hotel for dinner. Today, we’ll cross the border into Montenegro, to visit the Bay of Kotor, southern Europe’s largest fjord. You’ll have time to explore the UNESCO World Heritage Site of Kotor itself, before we journey to picturesque Budva, which, at over 2,500 years old, is one of the oldest settlements on the Adriatic coast. From here, we’ll head back to Dubrovnik. Enjoy a final day’s relaxation, perhaps returning to Dubrovnik for some more sightseeing and shopping, or taking a dip in the clear blue waters of the Adriatic. This evening, enjoy a farewell dinner at the hotel. Transfer the short distance to the airport and board your flight home at the end of a wonderful Croatian holiday.